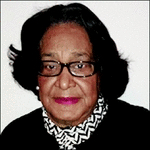 Obituary for Barbara S. Bushrod | McGuire Funeral Service, Inc.
Barbara S. Bushrod, 81, of Washington, DC was preceded in death by her husband, Maurice Bushrod. She was the mother of Eric Bushrod of Martinsburg, WV and Carla Slaughter (Patrick) of Clinton, MD; grandmother of Evann and Aaron Slaughter, Anthony, Lauren, Camille, Olivia and Isaiah Bushrod. She is also survived by sisters, Anne Vaughn (Walter) and Beatrice Stokes; and a host of other relatives and friends.